This post is a bit different as compared to the others. While I mostly write about cities to visit, in this post I talk about a very specific place to visit in Delhi. You might see more such posts as I am a native of Delhi. 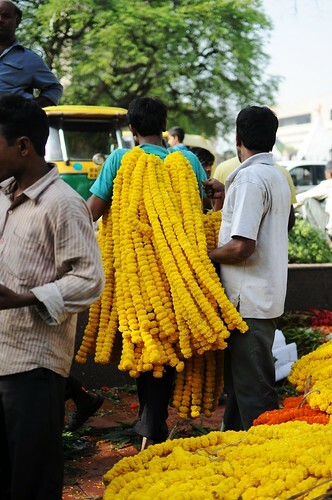 If you happen to up early one morning and you were in the city of Delhi, you might want to see the beautiful flower market. There are a few places you will find these markets. On of them is in Mehrauli near Qutab Minar and another is at Connaught Place right opposite the Hanuman Mandir. You can head out there and see amazing colours and an amazing variety of flowers. There is a general buzz in the air and the place overflows with flowers. Every corner there is something beautiful. From vibrant red to sober white to dashing purple its all there. 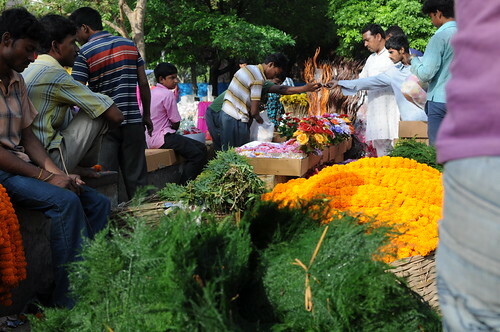 The flower market starts early and most of the flowers are sold off by 8:30-9 AM. Though the market slowly winds though after that and you only find some remnants of what was a very bustling and chaotic market. Weather you are looking to buy flowers (in which case you'll find some real good bargains and if you wish to test your negotiating skills there are some even better deals to be had.) or just experience a huge range of flowers or plants its surly worth a visit.